When coughs become a persistent nuisance, the simplest quick fix is to get your hands on some effective cough drops. But given the vast variety of cough drops available, how do you decide on the best one? To navigate through this dilemma, just remember not all products are created equal and that the best cough drops will have lots of satisfied users to back their therapeutic benefits. What can cough drops do? Based on this guideline, the most popular choice for effective relief from annoying coughs is the do TERRA ON Guard Protecting Throat Drops. These lozenges pack in a punch of soothing and cough suppressant properties that is sure to give you the relief you are looking for. Concocted form a fusion of potent essential oils, the doTERRA throat drops take their therapeutic value from a host of health benefits these oils have to offer. Alongside protecting the throat and its membranes from the irritation of coughs, these drops are also able to offer overall immunity boosting properties to the body. You can be sure to enjoy these benefits without the concern for any artificial ingredients included in this product. Before choosing a cough drop you need to know whether what you have is a wet or dry cough. A wet cough, also known as a productive cough, brings up phlegm and is often experienced during a cold or flu. A dry cough, on the other hand, gives you a tickling sensation at the back of the throat without bringing up any phlegm. This type of cough is more difficult to control and is caused by inflammation or irritation in the respiratory tract. A dry cough could also be the result of a respiratory infection. Cough drops work by dissolving in the mouth and soothing the irritation occurring there. While they can’t make the cough disappear entirely, they do target concerns like relieving the cough, easing sore throat discomfort, and calming the associated inflammation. Based on what formulation they use, some cough drops can also assist with opening up stuffy sinuses and clearing congestion in the chest. Many derive on the immune boosting power of vitamin C to keep you protected from further infections. But not every cough drop will do everything that you may be looking for. In fact, they are manufactured in different ways to yield different effects. For instance, some may cater more to expectorant effects while others works as demulcents. To get a better idea of which cough drop will do what, here is a look at some different types and what you can hope to from them. Cough drops can act as expectorants. This class of drugs help in clearing mucus and phlegm from the throat, lungs and bronchi. Cough drops contain small amounts of expectorants that help dissolve thick mucus and relieve respiratory difficulties. Expectorants work by sending signals to the body to increase hydration levels through secretions. This results in clearer secretions and lubricates irritated respiratory tracts. The other function cough drops perform is to serve as a decongestant. These ingredients are typically used to relieve nasal congestion in the upper respiratory tract. Decongestants reduce mucus formation and target inflammation in the nose, throat and sinuses. They are effective for shrinking swollen membranes in nasal passages to ease breathing. Demulcents are used to lubricate and protect mucous membranes. They form a protective film over the affected area and soothe symptoms. 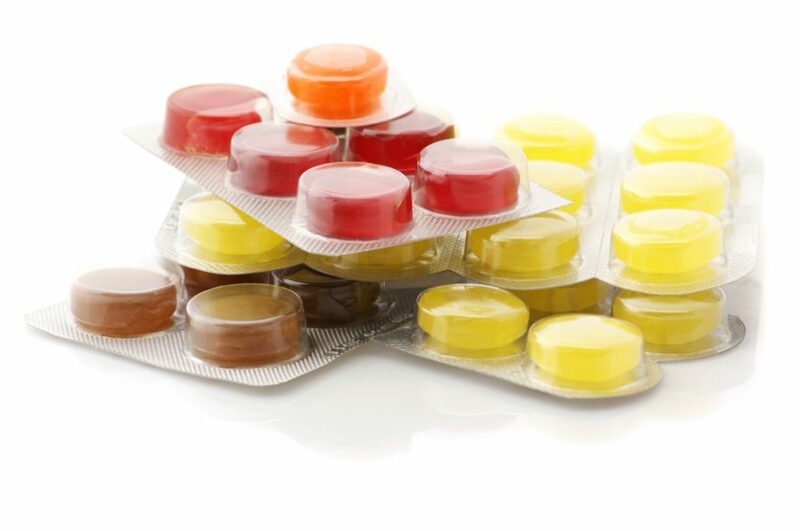 Honey and pectin are examples of common demulcents used in cough drops. Just as with any other product, cough drops come in different packages. These formulations often have some pharmaceutical purpose alongside providing relief from symptoms. These drops are usually fortified with immune strengthening ingredients such as vitamin C and zinc. Some certain ones may be engineered to produce numbing results to soothe an irritated throat while others do a better job of lubricating an aggravated airways. The flavor of these types of drops may remind you of having some sort of medicine. Common ingredients found in medicated cough drops can include dextromethorphan which is a very weak opiate that dulls the cough. Another ingredient is pseudoephedrine that acts as a decongestant that decreases mucus production. Guaifenesin in an expectorant that works to loosen secretion. For people who don’t appreciate the taste of medicated cough drops, there are other flavored varieties available as well. This often spans an array of fruity and minted flavors but there is always some active ingredient present to give the drops therapeutic value. Most flavored varieties rely on either, lemon, honey or menthol to do this. You may also like: Best Granite Sealer 2019 - Which is Right for You? 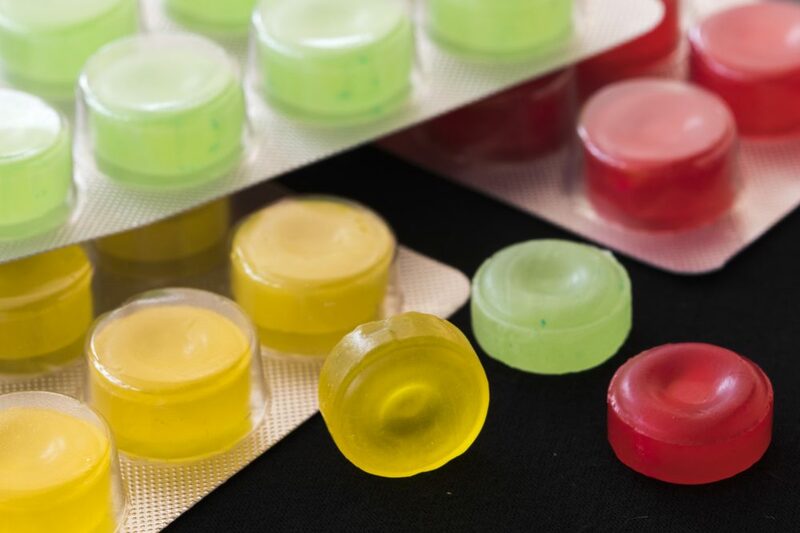 The one consideration to watch out for here is that flavored cough drops typically have a high sugar content which is helpful in stimulating saliva production, but can also be the downside to these drops. Diabetics in particular, and children in general need monitoring when using flavored cough drops. Most commercial brands use synthetic ingredients in their products in the form of added colors, flavorings or preservatives. 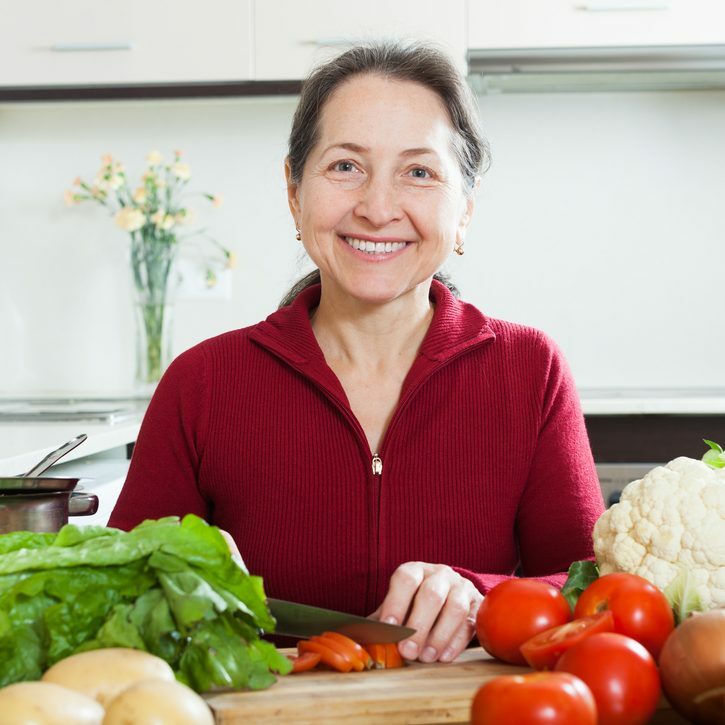 However, certain others make it a policy to use only all-natural ingredients. Needless to say that the all-natural varieties are definitely better, but sourcing their ingredients may drive up the price. The efficacy of both kinds doesn’t seem to be too different so if you don’t have any conditions preventing you from using synthetic ingredients, you could go either way. Perhaps the most popular ingredient in cough drops is none other than menthol. The primary reason why people use cough in the first place is to clear the nasal passages and ease the coughing. Menthol extract with its highly effective cooling sensation does just that. Menthol is derived from peppermint, eucalyptus, and other mint oils. Honey works in way different than menthol. Instead of the cooling and numbing sensation of menthol, honey works by coating the mucous membranes and providing relief from irritation in the area. The antiseptic properties of honey get to work on the throat lining for symptomatic relief. Dextromethrophan work as a cough suppressant that provides temporary relief from coughs without phlegm. This is a mild topical antiseptic and causes slight numbness to relieve throat irritation. Halls is the name everyone turns to when dealing with a nasty cough, irritated throat or just plain hoarseness. Being the largest manufacturer of cough drops in the world, the company knows a thing or to when it comes to providing relief to bothersome throat symptoms. That is why their sugar free cough drop formula with a honey lemon flavor is an all-time favorite among users. This value pack comes with 180 drops that provide a cooling sensation not only to the scratchy throat but the nasal passages as well. Containing the soothing properties of menthol, these cough suppressant drops can work alongside any other allergy medication you may be using during allergy season. The drops come individually wrapped in a resealable bag giving you a low cost solution for a dry mouth. Banking on the therapeutic value of lemon and honey for irritated throats this Halls product works with advanced vapor action that kicks in instantly to soothe the throat and provide a long lasting effect. Honey is a time honored way to soothe the throat and possesses antimicrobial activity. Given its viscous properties, it acts as an anti-inflammatory in the throat and lungs and its sticky texture helps relieve mucus membranes. Plus, it possesses many antioxidants all ready to strengthen the immune system and also act as an effective cough suppressant. On its own, honey may not be enough to cure a cough but can certainly provide relief without resorting to a prescription. Lemon, on the other hand, is known for its rich vitamin C content, an all-purpose immune booster. Lemons also reduce inflammation and offer a lot of infection fighting potential. Together, a combination of the two can do wonders to relieve an annoying cough. And the manufacturers at Halls seem to know this potent collaboration. The sweetness of honey used in their cough drops helps stimulate salivary glands inducing the release of mucus through the airways. At the same time lemon boosts this power by increasing immunity against infection. Both ingredients do their work by combing their antimicrobial and antioxidant forces to give you relief against coughs. Even though advertised as a sugar free formula, this product now contains sucralose. Hailing from New Zealand, this product uses the pure goodness of Manuka honey to soothe an irritated throat and suppress a cough. Manuka honey is known for its superior antibacterial properties setting it somewhat apart from traditional honey. Its active ingredient called methylglyoxal (MGO) gives Manuka honey many of its potent antibacterial effects. Manuka honey’s antibacterial and antiviral properties can reduce the associated inflammation of an irritated throat or cough and target the bacteria that cause the discomfort. Its sweet and unique flavor provides a soothing distraction from a dry throat. Its MGO content gives Manuka honey most of its antibiotic effect. Wedderspoon is a company recognized for its excellent Manuka honey sourcing and is non-GMO Project verified. Its Manuka honey drops with ginger and echinacea combine the medicinal power of these three ingredients to produce a cough drop that soothes the throat using simple, herbal ingredients. Along with the medicinal properties of Manuka honey for soothing the throat, ginger lends in a helping hand to boost the immune system and provide quick symptom relief. Its well-known anti-inflammatory activity also makes these cough drops more effective by targeting the bacteria causing a distressed throat. The echinacea content in these lozenges adds another boost to the immune system and helps fight bacteria. And while it can’t make the cough go away on its own, it can do a lot to shorten its duration. This is a kosher certified product that come in a pack of 120 grams. It is USDA certified and contains no artificial color, flavor or preservations. The Wedderspoon organic Manuka honey drops are also peanut, soy, dairy, and egg free with no trace of wheat, barley or rye. However, despite the great taste and soothing relief that these cough drops provide, the one unwanted thing included in the ingredients list is added sugar. For cough drops that are sourced from organic Manuka honey, added sugar seems like a nonessential ingredient. Another great flavor to soothe your throat is with wild cherry. These wild cherry flavored cough drops from Luden’s are a nice option to provide some much needed relief to irritated throats. The bark and fruit of this tree are used to make medicine and deliver therapeutic benefits such as relief from coughs and chest congestion. The wild cherry content in these cough drops soothe and tone the respiratory tract, loosen phlegm in the chest and throat in all types of coughs and throat irritations. Active ingredients in wild cherry include tannins, kaempferol, quercetin, acetylcholine, p-coumaric acid and caffeic acid. There is also a healthy dose of minerals including calcium, potassium, magnesium, phosphorus, iron and zinc. Collectively, these active ingredients present exceptional expectorant properties that can help loosen phlegm or mucus from the respiratory system. It thins mucus secretions and coats irritated respiratory tissue. 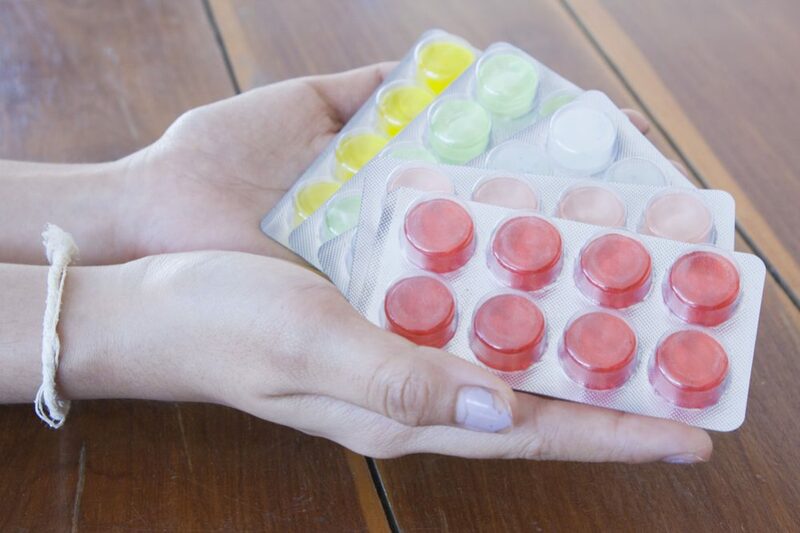 Sucking on these lozenges can clear out the bronchial tubes and allow you to breathe easier. Along with expectorant qualities, wild cherry also possesses antitussive properties suppressing coughs quickly and effectively. This pack of Luden’s Wild Cherry Cough Drops holds 90 individually wrapped pieces that come in a resealable bag. Along with all the benefits of wild cherry, these drops are infused with the active ingredient pectin that acts as an oral demulcent. It is better for dry cough problems as pectin holds the ability to generate a soothing layer over the surface of the throat, preventing it from drying out further. The packaging for this product is an eye catcher with its bright red resealable bag. You get a pack of 90 lozenges at an excellent price and if you like the wild cherry flavor, then nothing like it. So if you are looking for a non-menthol based alternative cough lozenge then the Luden’s Wild Cherry formula is for you. No list of the best cough drops can be complete without adding in a menthol based product. This cough drops from Ricola packs all the potency of menthol. This pack comes with 19 cough drops packed in one bag to yield some effective menthol power for persistent coughs. In contrast to your other cough drops that are structured like a hard candy, this Ricola product comes with a syrup center to give you the relief you trust. The outer hard coating is like any other cough drop that soothes the throat. But that changes as your make your way to the soft center inside. Using only natural colorings and flavors, Ricola is a renowned brand for supplying effective cough suppressing formulas. With their take on the menthol cough drop, you get a product that feels cool, soothing and provides temporary relief from a cough. The menthol content creates a numbing effect providing interim relief from the discomfort of coughing. The menthol works as an analgesic to relieve the pain felt in the throat. Ricola glacier mint cough drops are suitable for treating the discomfort of both wet and dry coughs. If your cough is part of a larger package such as a cold, then the menthol will be helpful in unblocking air passages to make breathing easier. Packaging the power of an additional 10-herb mixture, the Glacier Mint cough drops offer the perfect blend of menthol and herbal power. All herbs are grown using sustainable farming without the use of artificial pesticides, insecticides or herbicides. To authenticate and preserve freshness, all Ricola drops are manufactured exclusively in Switzerland. 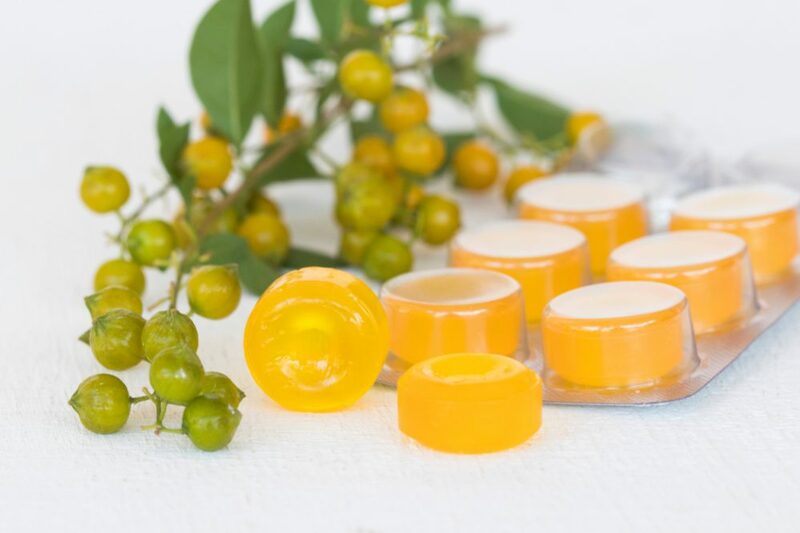 The all natural ingredients used by the company indicates that these cough drops are safe and have a low chance of interacting with other medication. These are suitable for dry and wet coughs. The Ricola name is a trusted brand known for treating coughs and sore throats for over 75 years. You can be sure that you are getting a quality trusted product for your throat. Combining a handful of unorthodox ingredients and putting them together in a cough drop is what do TERRA does with its On Guard lozenges. 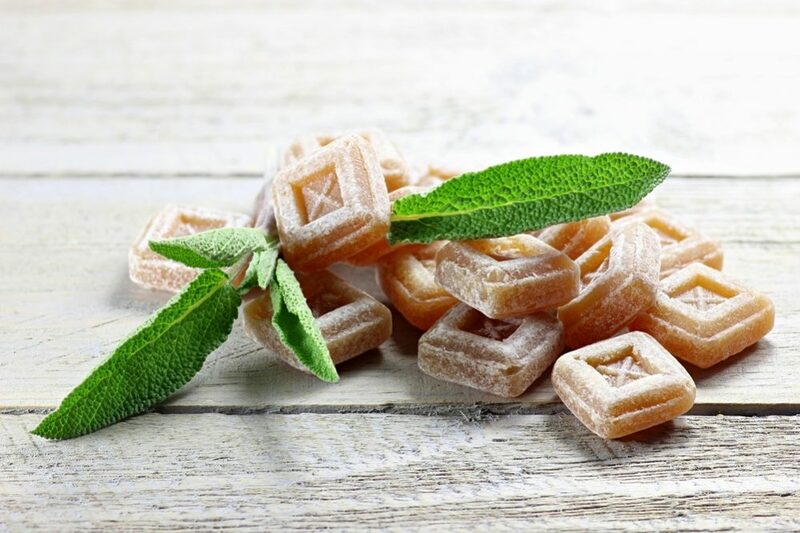 These lozenges take a blend of pure essential oils including clove, cinnamon, eucalyptus, wild orange, and myrrh and more to give your throat the soothing relief it seeks when suffering from a cough. Clove is an ingredient known for relieving throat irritation and coughs. It has expectorant and antiseptic properties with most of its potency coming from the compound eugenol. A dose of clove oil will not only clear the nasal passages but also present a cooling effect on the throat and nasal cavity. Cinnamon oil, on the other hand, comes fortified with anti-inflammatory, antimicrobial, antioxidant and immunomodulatory effects making it a very good choice for fighting infections like a sore throat. Eucalyptus oil can not only silence a cough, but also help get the mucus out of the chest. Wild orange essential oil has immune enhancing properties to fight infections while myrrh has powerful cleansing properties often involved in cleansing the mouth and throat. With the immune boosting, expectorant, and antiseptic qualities of all these ingredients put together in one throat lozenge, you can be sure that it will deliver results. This product is free of added colors or flavors and uses the sweetness of organic evaporated cane juice and organic brown rice syrup to flavor their throat drops. One bag packs 30 all natural drops to give your quick soothing relief. However, when compared to other similar products, a pack of 30 lozenges seems a little pricey. Users who are loyal to the brand don’t mind paying the price as it gives them the relief they are looking for. There is a warning for pregnant or nursing women to first consult with their doctor before using this product. This concern could be because of the essential oil content in the drops since not every essential oil is recommended for use during gestation or while breastfeeding. To relieve the discomfort of a cough, the do TERRA Protecting Throat Drops promise to do a better job than other cough drops in this category. These drops draw their potency from a carefully formulated blend of important essential oils that have immense health boosting potential. Their relief providing efficacy also seems to last longer than other cough drops meaning one will give you relief for longer than having to take repeated doses to keep your throat calm. Because cough drops often have synthetic ingredients included to maximize their soothing effects, and these drops don’t, this do TERRA product stands out from the rest of the competition. You can rest assured that you getting nothing but the best to relieve your irritated throat and calm your cough.